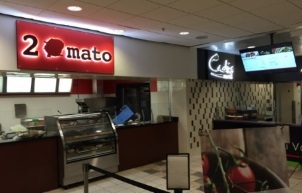 The Capitol Commons cafe, located in the Floyd Building, is GBA's largest cafeteria and serves over 9,400 people each week. The cafeteria is located across from the State Capitol, and used by legislators, lobbyists, state employees, downtown employees and visitors to Capitol Hill every day. The cafeteria is a smoke-free environment, and the Twin Towers building offers seating inside, outside and in the plaza level solarium with a spectacular view of the gold dome and beautiful Capitol Hill. The Capitol Commons cafe is open from 6:45 a.m. to 2:00 p.m. Monday through Friday and is closed on state holidays.